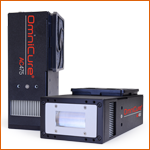 Designed with a unique combination of high output LEDs and custom optics, the OmniCure AC450/P and OmniCure AC475/P air-cooled UV LED curing systems provide high irradiance (>8W/cm2) at flexible working distances, enabling manufacturers to achieve outstanding productivity with reduced running costs. Utilizing our patented process for individually addressing each UV LED module output, the OmniCure AC450/P and OmniCure AC475/P LED curing systems offer consistent results by ensuring high longitudinal uniformity over the entire 50mm (2″) to 75mm (3″) curing area. A uniform exposure area allows for curing of larger and/or multiple parts simultaneously. It also offers the ability to convert a static curing process to one where parts are being cured while in motion in order to increase throughput.